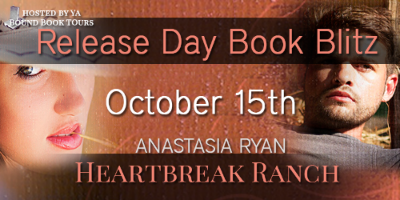 Heartbreak Ranch is the debut novel by Anastasia Ryan. I'm a big fan of romances that take place at dude ranches, farms, or pretty much anywhere around horses so, I was up for reading this one right away. I never understand how the characters could dread going to a ranch for a vacation like Graysen does, but at least she comes around. Aside from her farm life issues, she's a pretty fun and adventurous character. The pressure her family put her under bothered me quite a bit, especially her brother, but you later learn he has his reasons. The author wrote Colt's character in such a way that he was very easy to visualize. and it wasn't a bad visual I might add. Graysen and Colt are comfortable with each other pretty quick. The overall romance happens very quickly actually, and they have their naughty moments. Heartbreak Ranch was a quick read and didn't really surprise me at any point. Heartbreak Ranch was comfortably predictable with many cute moments, which makes for an easy escape. 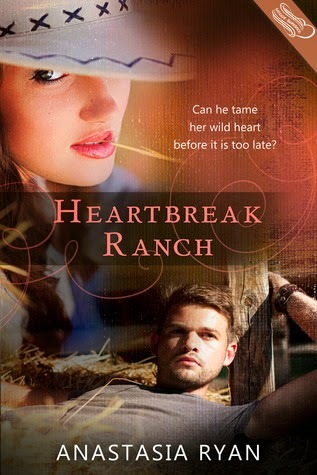 Heartbreak Ranch by Anastasia Ryan was provided to me by YA Bound for review. The opinions are my own. To learn more about Anastasia Ryan and her books, visit her blog.You can also find her on Goodreads, Facebook, and Twitter.